A protest was held in Baħrija valley yesterday against the construction of a farmhouse. Photo: Darrin Zammit Lupi. A couple of hundreds of people gathered in Baħrija's main square yesterday to protest against the construction of a farmhouse belonging to Nationalist Party president Victor Scerri, which they claimed destroyed the pristine valley below. 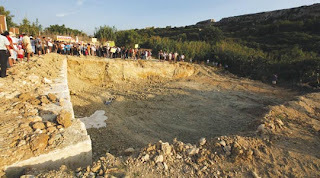 The protestors led by the Ramblers' Association, Flimkien Għal Ambjent Aħjar and Nature Trust walked silently all the way down to the site where excava- tion works are in an advanced stage. The construction is taking place in a scheduled area outside the development zone and barely two metres away from the watercourse at the bottom of the valley. The environmental groups re-iterated their appeal to the Prime Minister to interveneand stop the permit, which they claimed was issued by the Malta Environment and Planning Authority in breach of its own policies. The protest was attended also by Labour MEPs Edward Scicluna and Joseph Cuschieri, Nationalist MEP candidate Alan Deidun, various Labour MPs including environment spokesman Leo Brincat, Rabat mayor Sandro Craus and Azzjoni Nazzjonali spokesman John Spiteri Gingell. Protestors carried various placards some of which read: "Where have the strong pair of hands gone? "; "Musumeci, Green Politician of the Year"; "Outrageous development zones"; "Do you want to build in the countryside? Phone Mepa now". In a brief address, Astrid Vella for the FAA recalled the Prime Minister's commitment that the rationalisation of development zones undertaken in 2006 had to "seal" the areas where development could take place and that no more permits in ODZs would be issued. She said what was happening in Baħrija was symptomatic of dev-elopment trends in other parts of the islands where developers were applying for permits in ODZ areas and getting them. The president of the Ramblers' Association, Lino Bugeja said this was the "fourth summer of discontent" for his association in relation to the Baħrija valley after having fought for public access to the foreshore in the same area. Without mentioning the Prime Minister by name, Mr Bugeja asked whether his "silence" meant that he approved of the project. Similar to what happened during a press conference last Wednesday, the architect of the development, Robert Musumeci, also came under fire. The case, first raised by the Labour Party during the European Parliament election campaign, was recommended for refusal four times by the planning authority's technical officers between 2000 and 2007 but different boards eventually approved it. The protestors said they could not understand Mepa's behaviour since every case officer's report had listed tens of reasons against the granting of the permit. The project is a three-roomed farmhouse, for which Dr Scerri obtained permission to demolish and rebuild despite initial objections by Mepa for the partial demolition of the old farmhouse. In a statement, Dr Scerri insisted that the work being carried out in Baħrija had all the necessary permits and had followed the normal process that went on for a number of years. Throughout this period, no protests had been made according to procedures and these had only started now that the formal process had come to an end. The place for protests, Dr Scerri said, was in the institutions that had the responsibility and authority to regulate matters and their time was during the evaluation and decision process. It was an injustice to allow the process to end without saying anything and then to use the fact that he was involved in politics in order to reach particular aims. His case, he said, had been treated at a technical level and at no time was his involvement in politics been influential. The whole affair took a new twist on Monday when Dr Scerri wrote to the Police Commissioner and Mepa chairman asking them to investigate claims that he exerted undue pressure to be granted permits for his land in Baħrija. Mepa chairman Austin Walker confirmed he would be investigating the claims made by Dr Scerri. He said: "It is within my competence to investigate the matter internally but it is too early to reach a conclusion. The outline development permit was issued in 2000, so I have to go back and look at all stages of the case".